n Arbor Day was observed in Meeker in a truly public, spirited way. Our citizens, both ladies and gentlemen, turned out in force. Ninety-two trees were planted in two lines east and west parallel and 15 feet apart each way across the park … making 262 trees altogether inside the park. n Colonel Cook of the W.R. Land and Cattle company, who spent the winter in merry England, has returned. n Everybody is breaking ground this season and will raise their own oats and garden truck. n The settlers on Hunter’s Creek have built a bridge across Piceance at the mouth of Hunter’s Creek. n The JIC Restaurant with S.A. Rice proprietor has opened. Mr. Rice is an old restaurant man and proposes to run a restaurant that will command the public patronage. n Mother’s Day contest at A. Oldland & Company. Prizes for the following categories: Oldest mother, oldest grandmother, youngest grandmother, mother of most children, grandmother of most grandchildren, youngest mother. n April 26, 1961 weather: High temperature, 53F. Low temperature, 20F. n Rev. Max Weir, minister of the Meeker Bible Church, has been in Chicago this week attending the National Convention of the Independent Fundamental churches of America. n Lost: Three head of cows with calves at side. Brand F11. Call Bud Cox. 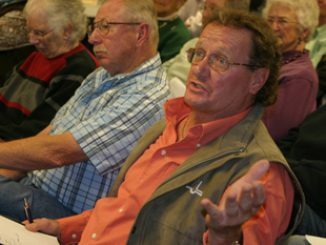 n A long-standing controversy over the Puckett Gulch Road came to a head at the commissioners’ meeting. Six area landowners asked the county to abandon the 1912 right-of-way and close the road. Debate over the road dated back to 1971.
n Miss Cathi Collins, daughter of Richard and Mary Anne Collins, has enlisted in the U.S. Army. n April 28, 1986 temperatures: High, 65. Low, 37.
n Members of the Meeker High School Student Council and student body got together this past weekend to clean the graffiti off the Sixth Street wall. n Track Royalty: Panther Invitational Queen Mary Bell, freshman attendant Debbie Enterline, sophomore attendance Cheryl Clark, senior attendant Diana Martin and junior attendant Cheryl Striegel. n Dam project meeting draws over 100 interested citizens. n 1600 feet of oil was reported in the hole at Mobil’s exploration well near Dinosaur. n The board of RE-4 adopted plans for the new Rangely Elementary School. n Police Chief E.W. Long resigned after 14 years of service to the community. n Rangely Hospital births: Preble Giltz and Deedra Dawn Ridings. n Pinewood Derby winners: Hank Allred for the fastest car and Wayne Pennell for the best design. n Easter egg hunt winners: Michelle Palmer, Lance Sizemore, Dennis Rowley, Casey Kenney, Michelle Usery, Charles McDerment, James Killpack and Darrell Ahrens. n RHS junior Brian Palmer placed third at the ninth annual National Bridge Building Contest in Denver. n Weather for April 28, 1986: High of 76F, low of 36F. n “Hello, Dolly!” will be performed at the Rangely High School Auditorium. n Rangely Insurance Group, new owners Phil and Barbara Widmer. n The National Secondary Education Council announced today that Rodger Polley has been named an Academic All-American. The Meeker Herald — 125 years ago • Frank Clark has been busy this week tearing out the partitions in the Major building. The place will make a fine dancing hall. RBC I It was standing room only at Meeker’s board of trustees meeting Tuesday. Residents packed Town Hall to discuss the future of the elementary school building.